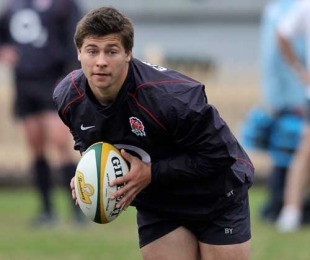 Ben Youngs is set to face Mike Phillips for the first time when England take on Wales at the Millennium Stadium on Friday night and the Leicester scrum-half does not intend to take a backwards step. The 21-year-old is one of the world's form No.9s and is out to target Phillips, despite the fact that the former British & Irish Lion will hold a big physical advantage. Youngs has joined the growing number of critics of Phillips' passing, branding it 'alright' and is excited by the prospect of taking him on. "Mike Phillips is a big guy. There will be a bit of banter around the scrum and he will probably try and push me about a bit but that is to be expected," Youngs said. "As long as you know what is coming your way you can prepare to be in the right place and not be put off by it. "I expect him to be physical with me and maybe a bit of sledging but it is part of the game. There is nothing wrong with a bit of niggle now and then. I have seen a lot of him. I thought he was outstanding on the Lions tour. He makes his tackles and he is strong and he will pick and go like a back-rower. "His passing is alright but there are areas of his game I will be targeting. I have the utmost respect for him. I will relish that challenge to play against him." England have not won in Cardiff since 2003, the last time they won the Six Nations, and Youngs believes that they are edging closer to their goal of silverware. "People are more aware what we are capable of now," Youngs said. "They have seen that we can beat Australia by a huge amount, Samoa are not an easy side and we came closer to New Zealand than any other team. We are in a good place and we can kick on. It is about time. We want to get some trophies."